Next Generation Science Standards: Coming Soon to Arkansas? While the Common Core State Standards have dominated the standards’ limelight, we at the OEP also wanted to examine Common Core’s lesser-known cousin, the Next Generation Science Standards (NGSS). In our newest policy brief, we discuss the possibility that the NGSS will have an Arkansas presence in the future, and if so, what this presence could mean for our K-12 students, educators, administrators, and other education stakeholders. 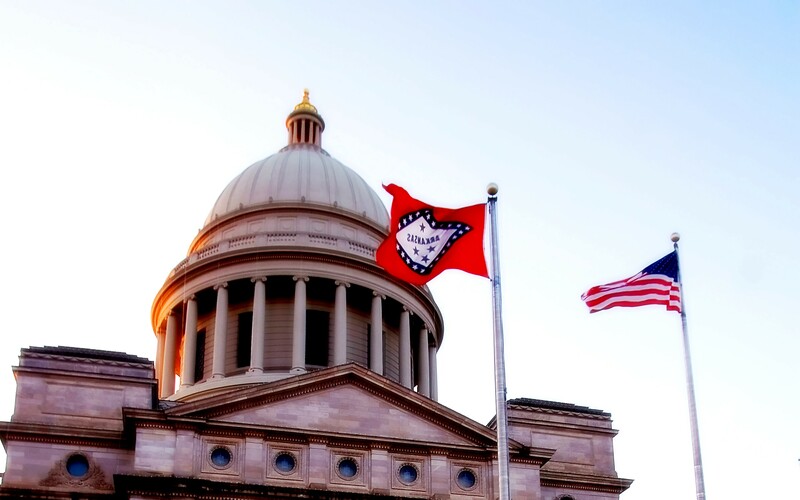 The policy brief explores the motivation for new science standards, the current status of the NGSS, arguments for and against the standards, and a synopsis of the situation in Arkansas. The Next Generation Science Standards are K-12 performance expectations for science that states may voluntarily adopt. Similar to the Common Core, the NGSS provide guidance in terms of what students should learn in each grade, K-12, but leaves decisions about curricula up to local school districts. Arkansas is not included in the 13 “early adopters” but the Natural State is considered to be halfway to adoption, as this Science Standards Timeline for implementation from the ADE shows. More information about Arkansas’ potential adoption of the NGSS is available here. Just as for the Common Core, there are both ardent supporters and critics of the NGSS. Supporters of the NGSS are in favor of the standards’ emphasis on critical thinking and potential to prepare students for STEM careers. Supporters of the standards include representatives from several Fortune 500 companies, including ExxonMobil, Intel Corp, and Time Warner Cable, and prominent foundations, such as the Carnegie Corporation of New York. Possible conflict of interest: Fordham has their own set of science content standards. Follow this link and then scroll down through the document to page 55, and you will find their standards listed on pages 55 – 61. Fordham’s science criteria earned low marks: Jack Hassard of the National Education Policy Center analyzed Fordham’s science crtieria using the Bloom categories in the Cognitive, Affective and Psycho-motor Domain. The Fordham science criteria scored low by these assessment criteria. 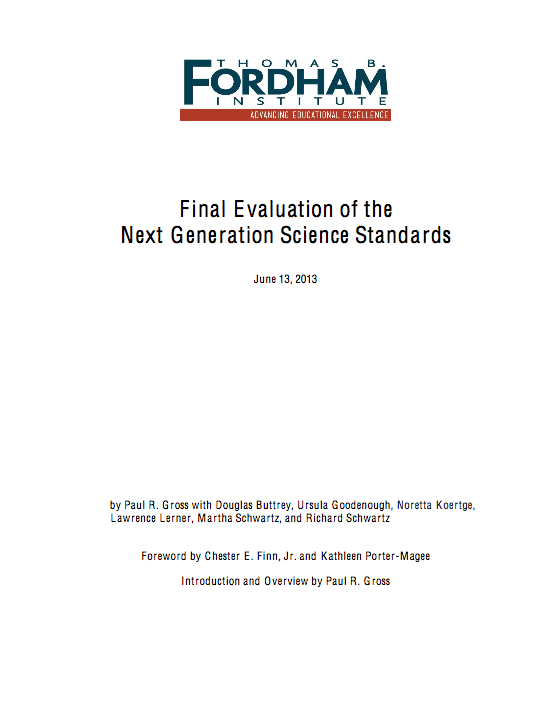 An Arkansas committee also differed in opinion from Fordham; 88% of the committee developed in Arkansas ranked the NGSS as higher than the current Arkansas science standards. These sorts of determinations about the quality of standards can be difficult to make and controversial. So, is the NGSS a good option for Arkansas? Next, we will look at some Arkansas-specific information in relation to the standards. At the Joint Education Committee meeting on August 11, 2014, Dr. Debbie Jones, Assistant Commissioner of Learning Services for the ADE gave a presentation to legislators on the Next Generation Science Standards. NGSS will help Arkansas students graduate high school prepared to succeed in college and careers, especially given the job growth in STEM fields. In contrast to the current standards, which focus on memorizing facts, the NGSS require higher-level thinking. Performance expectations are based on three elements that can be observed in a science classroom: (a) science and engineering practice activities, (b) disciplinary core ideas, and (c) cross-cutting concepts. Connections across subject matter areas are timely and appropriate to reinforce learning. The NGSS implementation plan has been carefully designed in order to allow time for schools to prepare for the change. Lower quality: Rep. Meeks expressed his “very serious concerns” that Arkansas is lowering its science standards by adopting NGSS. He cited the Fordham Institute study that indicates Arkansas standards are better than NGSS. “Political issues being treated as facts:” Rep. Meeks also expressed concern that political issues are being treated as facts, pointing to a sentence on the last page of the handout that he perceived as treating climate change/global warming as factual. Jones noted that the statement in question is worded “impact of humans… on the local environment” and does not imply anything political, including global warming. Science Accountability & Testing: Representative Douglas stated that K-4 teachers have told her they do not put science in the curriculum because they do not have time for material on which students are not tested. She questioned how teachers can be held accountable for new standards, asking, “How will these be implemented if we have standards now that aren’t being taught?” Jones replied that the group will address such issues as it moves into the assessment phase of the process. Financial Impact: Other legislators questioned the financial impact on school districts of implementing the NGSS. Dr. Jones noted that the implementation timeline aligns with the cycle for adopting new materials, so that any new materials will be worked into the current cycle to avoid extra expense. One of the reasons cited for development of the NGSS is because American performance in science has been weak. So, how do Arkansas students typically perform on science assessments? In short, the answer is not very well, although there has been some improvement in recent years. Historically, Arkansas students score less well in science than they do in math and literacy. For example, in 2013-14, 82% of 5th graders scored proficient/advanced in literacy, 68% in math, and 57% in science. The difference in scores is more pronounced in 7th grade, where in the same year, 77% of 7th graders scored proficient/advanced in literacy, 69% in math and only 37% in science. 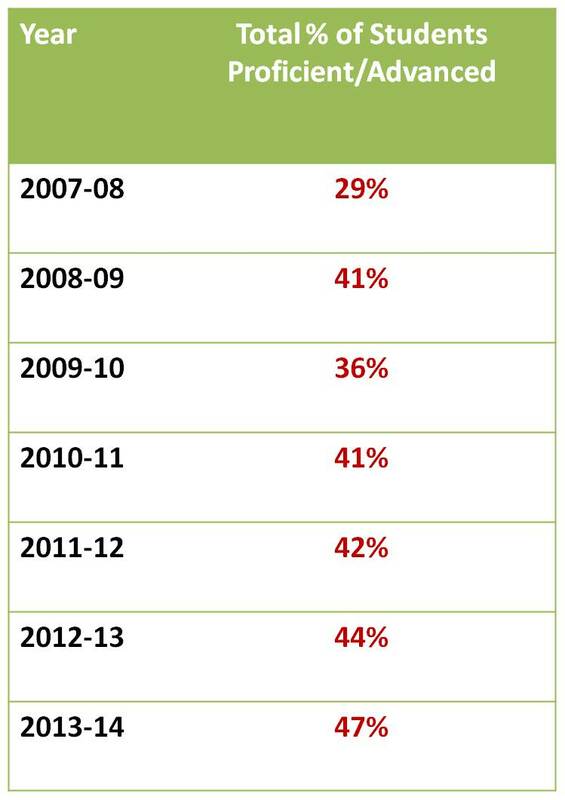 As illustrated in this graph, science testing in Arkansas is newer than testing in math and literacy. There are six years of science data vs. ten years of math and literacy data. One potential reason for the difference in scores could be that students are more consistently instructed in math and literacy because it is tested every year in grades 3-8, whereas science is only tested in 5th and 7th grade. As a result, teachers may feel pressured to focus instruction on math and literacy rather than science. Additionally, schools are not held accountable for science results under No Child Left Behind, thus administrators and teachers may not place as heavy of an emphasis on science. Finally, scores on the science exams may be lower simply because the tests are newer than math and literacy tests. We have seen a steady increase in math and literacy scores over time, which may indicate that scores get better as teachers and schools gain a better understanding of what is being assessed. A similar pattern can be seen for science although the scores are lower. It is possible that science scores look lower than math and literacy scores simply because the tests have not been around as long for teachers to familiarize themselves with the tests and tailor their instruction accordingly. 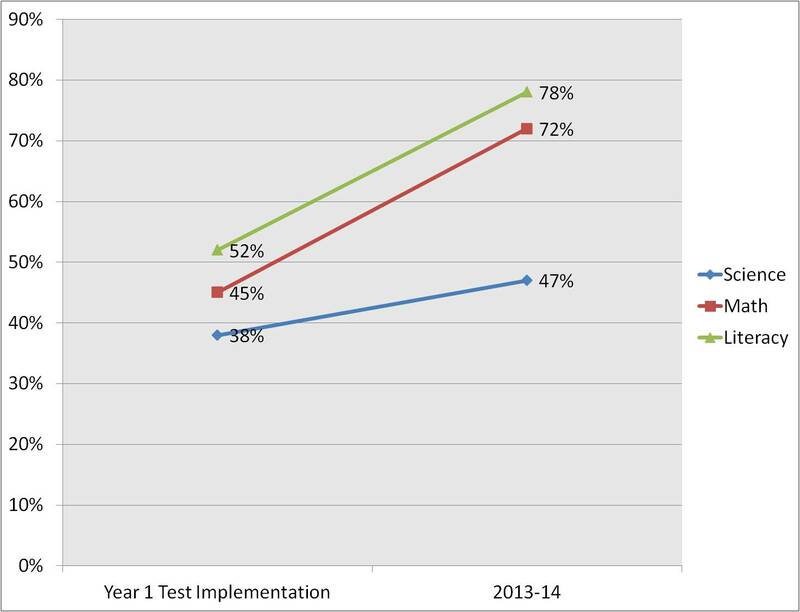 This graph illustrates the level of improvement shown in science, math, and literacy tests from the first year of the test’s implementation to the most recent data from 2013-14. Arkansas students have shown the greatest gains in math (27 percentage points), followed by literacy (26 percentage points) and then science, which has shown sluggish growth of 9 percentage points. Again, it should be noted that Arkansas has been testing in math and literacy for four more years than science. 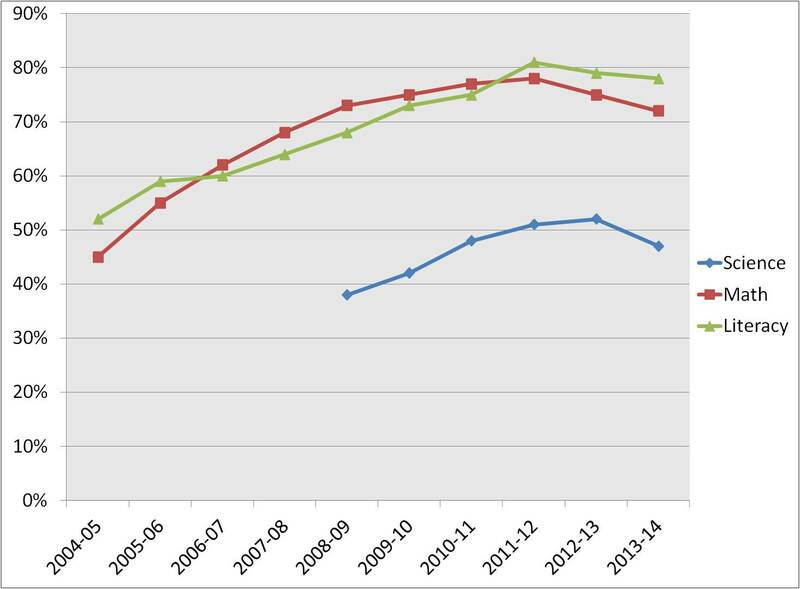 Although science scores dipped last year, the following graph of 5th graders’ performance shows that since 2008, science scores have been slowly rising. The pattern for 7th graders is similar, but 7th graders have performed less well than the 5th graders. Another “measuring stick” that we have available to help us compare Arkansas’ science test results is the NAEP (National Assessment of Educational Progress, also known as the “Nation’s Report Card”) exam. The following graph compares 8th grade NAEP Science scores with 7th grade Arkansas Benchmark Science scores. 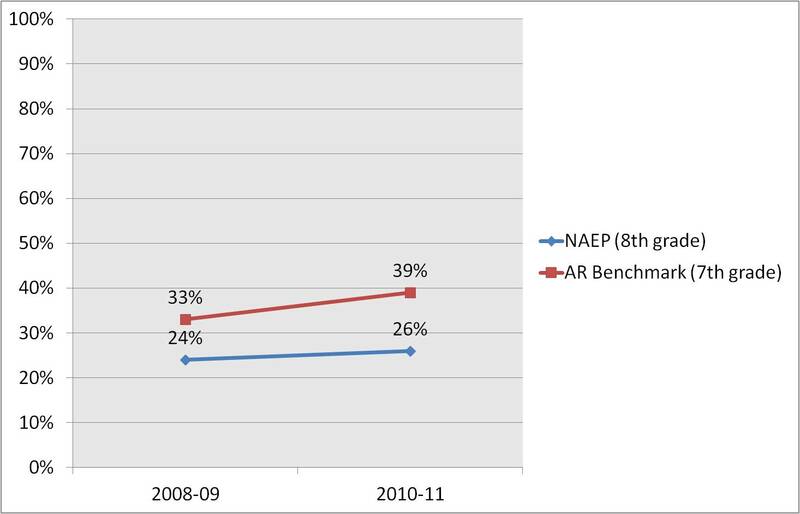 As can be seen from the graph, Arkansas students have performed less well on the NAEP exam. More information on NAEP Science test results are available here. Of the four End-of-Course (EOC) exams (Literacy, Algebra, Geometry, and Biology), Biology has the lowest exam scores nearly every year. In 2012-13, only 44% of students scored proficient or advanced on this exam while in every other EOC exam, overall Arkansas students’ scores were above 70% proficient or advanced. Low Biology EOC scores are comparable across regions, with Northwest Arkansas often scoring the highest, but not by much. 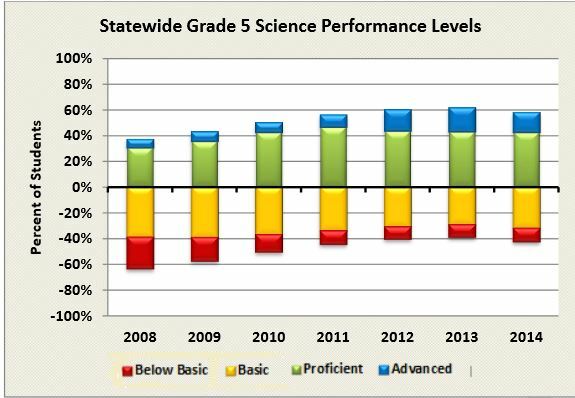 As you can see from the table, testing well in Biology has been a struggle for Arkansas, although there was recent improvement in the 2013-14 scores. In conclusion, Arkansas students have historically not performed as well in science as they have in other subjects, but there are many factors that could contribute to this performance other than the current science standards that Arkansas has in place. 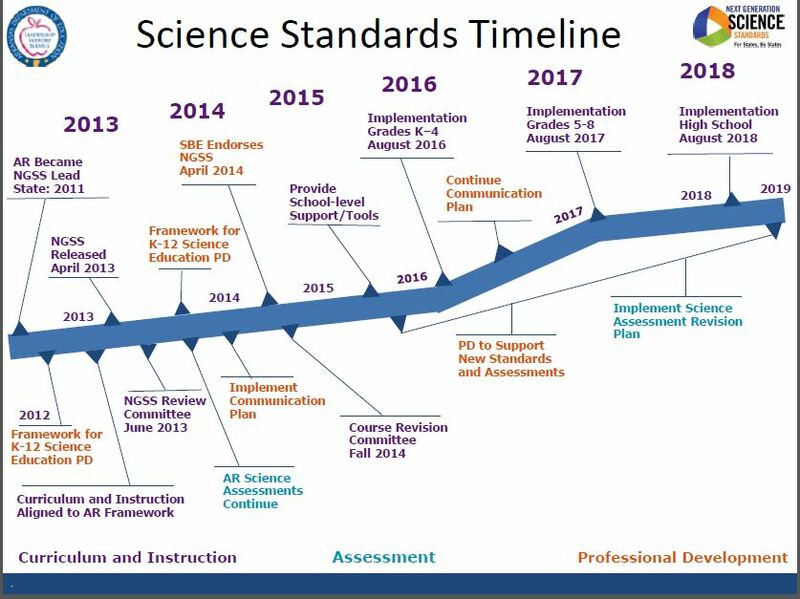 Arkansas is currently halfway to adoption of the NGSS (which, if adopted, will be adapted and become the Arkansas Science Standards), and there is a thorough plan in place for adoption and implementation of the standards. However, it is difficult to predict if new science standards will increase student achievement. As with Common Core, implementation of the standards will be a key factor. The ADE has created a survey for all science teachers, curriculum specialists, and administrators to gather their input on the new standards, which you can find here. Check out our newest policy brief for more information!